This Demonstration constructs a triangle given the circumradius , inradius and the length of the base . Draw a circle of radius and a chord of length . Step 1: Let be the midpoint of and let the right bisector of meet at the point . 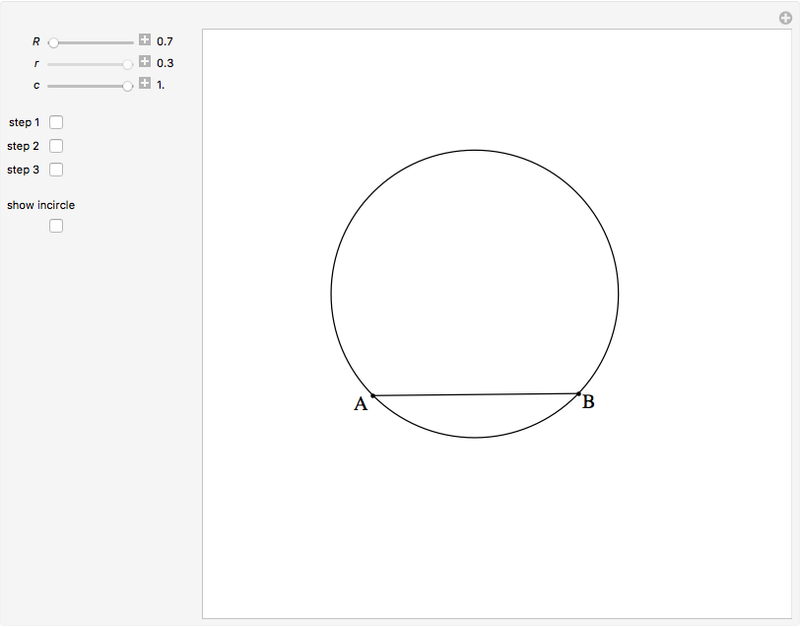 Step 2: Draw a second circle with center through and . Draw a (green) line perpendicular to at so that . Clearly is parallel to . Step 3: Let be one of the points of intersection of and . The point is the intersection of and the ray . Since arc equals arc , bisects and . Also . The triangle is isosceles, so . Then . So is the incenter of with distance from . Izidor Hafner "6. Construct a Triangle Given Its Circumradius, Inradius and the Length of Its Base"